: from my dad. he was and still is a big fan of elvis. : his looks, obviously, as well as his beautiful voice. he can hit just about any note. i just want him to see his daughter and what a huge success she's become. i would also like a kiss, a hug, and an autograph! : can't really pick just one, it's to hard but i really love the song ' moody blue' and the movie' kissin cousin's' was funny. : i love 'moody blue' because it's so upbeat and you can dance to it. and i like how he plays a twin in 'kissin cousin's'. : that's an easy one. his family, friends, and fans. : i was born in 1984 so technically i wasn't born when he passed but when i first heard about it, i was speechless. it was really heartbreaking and still is. : his music was amazing. not only the lyrics but his beautiful voice is what made him the legend that he is. i know his music will never fade. ELVIS ROCKS!!! : i would say that you can add just a little more pictures but other than that, it's great! Thank you for your valued comments on our survey. 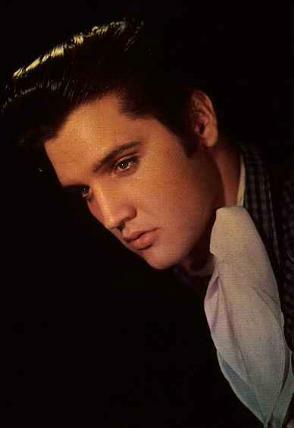 Elvis' voice was absolutely the Best and his looks, well, no other will ever come close. He was so handsome.